An usually warm end of January, even by Texas standards, presented me with a unique opportunity in 2016. With clear skies in the forecast a chance to get an early start to both my camping season and astrophotography year was too good to pass up. 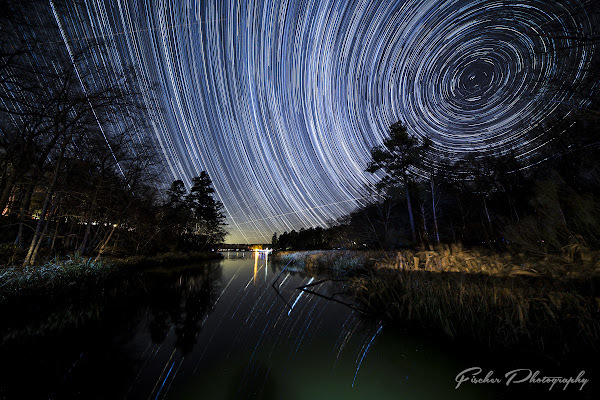 On a previous trip I had scouted a location along the shore of Tyler State Park which I felt had potential for a star trail sequence, so the race was on to get a camp site as close to the shoot location as possible. With camp setup and enough cellphone signal to get me through the boredom of running a 90-120min sequence on a solo trip, I setup my camera on the small wooden bridge spanning the inlet and settled down to wait while the camera did it’s work. This was my third visit to Tyler State Park, which is quickly becoming one of my favorite weekend camping destinations. Easily close enough to the east Texas town of Tyler to run in for dinner, but once on the park grounds you’re well separated from the rush and noise of an urban environment. Towering pine trees and miles of beautiful hiking trails circle a nice sized lake situated at the center of the park. My first full day on this trip I spent the morning hiking the entire shoreline trail, making notes of any location along the way I thought might be a suitable location for either a sunrise, sunset, or astrophotography photo later. 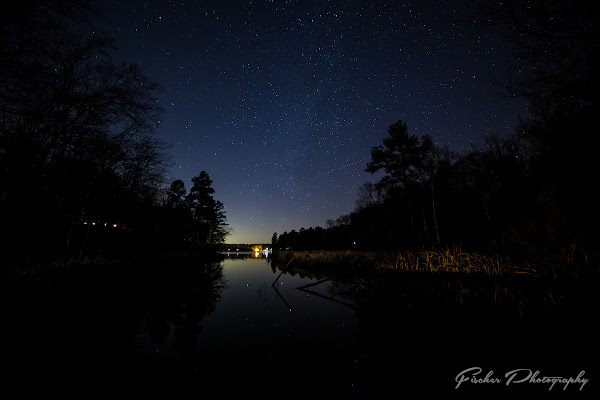 Without finding a better option for my desired star trails shot that evening during the hike, I settled on the long thin inlet on the south east corner of the lake at the tip of the Hickory Hollow camp area where my campsite was located. A small wooden bridge spans base of this inlet, providing a dry passage across the marsh and creek on this end of the lake. Setting up both of my Canon 6D cameras, one with the Rokinon 14mm and the other with the Canon EF 28mm to double the number of photos I’d ultimately get from my 2hr wait, on the small wooden bridge just as the sun was setting. I was worried that the smoke from the numerous camp fires in the Hickory Hollow camp area would drift towards me and mute and washout the view of the darkening skies above. Luckily the winds which were mostly being blocked by the hills on either side of the camp area quickly sent the smoke in the opposite direction once it reached the treeline. I knew my view wasn’t due north, but with the 14mm lens I felt I had a good chance of having the north star in frame, around which all other stars circle. 14mm covers a LOT of sky and foreground both, using the live-view on the camera’s rear screen I set a composition that put the mouth of the inlet on the left third of the frame, giving me the best possible chance of getting the north star, which would be somewhere to the right, within the field of view. Setting both cameras to full manual, both focus and exposure, I set focus to true infinity (not relying on the focus scale but rather the live-view zoomed in on a spot on the horizon and then again on the first stars appearing in the heavens). Next I took a series of foreground specific shots, with the intent of using them to replace out the ultimately blurred foregrounds resulting from stacking 2 hours of 30 second shots. With the foreground shots in the bag, I adjusted the exposure time, ISO and aperture for the star trail sequence, Aperture was opened to f/2.8, and an exposure time of 30sec per frame. Once the sky was dark enough to start the star trail set, I locked both camera’s wired remote shutter releases down, carefully hung the release where it would not swing with any stray breeze and cause blur in the photo, and retreated to the near by bench to wait till I got bored enough to call it a night. Processing a star-trail shot takes several more steps than most photos. For starters you need to stack each of the individual frames into a single view to display the movement of the stars. Starting as always in Lightroom I created separate folders for each set of photos from the two cameras, since they were running at the same time the two sets were mixed together after import. Thankfully the file numbers were unique and I could easily filter and move each set into it’s own working folder. I made my initial edits to the first frame in the sequence, adjusting white balance (3350/+6), adding a bit of contrast (+29), Highlights (+12), Whites (+24), blacks (-10), Clarity (+40) and Vibrance (+45) as well as minor sharpening, a healthy dose of noise reduction and setting the lens correction. I was only interested in getting the sky the way I wanted it to look, the trees and foreground would be blended in later via Photoshop from those first frames I took specifically for the purpose. Using the Sync feature of Lightroom, I applied these same changes to the entire sequence of photos and then set Lightroom to the task of exporting each of these RAW files to full sized, high quality JPG files for use in the next step – StarStax. StarStax is a freeware program for stacking star trail photos, and it does a pretty good job of it. Using the ‘Gap Filling’ mode, I ran my entire sequence through the program to create a single star trail photo from the 223 individual frames. The result was a beautiful sky filled with the movement of the stars, but as expected the foreground left a bit to be desired. Importing the finished StarStax photo into Lightroom along side its original frames, and the foreground frames, I exported my desired foreground photo and the StarStax image into Photoshop for the final blend. Using layer masks, I blended the two photos together, showing only the foreground of the grasses and trees through from the single frame. A few minor finishing touches were made to balance colors and white balance, remove any light sources from across the lake or camp sites shining through the tree line. For this photo, I opted to leave in the various aircraft and satellite trails which cross the sky through the star trails. There are methods for removing these trails, and its a subject I hope to write a tutorial on in the near future after I experiment with a few more different ideas. Nice article Jon. Makes an interesting as well as informative read. Thank you!